Happy Monday Lovers. Let me be honest about today’s #PYMAffirmation…. I shuffled the cards and this one came up for my random pick. My inner froggy self didn’t want to hear it so I put it back in the deck and drew another card. Guess what came up again? Divine Timing. The universe obviously feels that I (and you perhaps) need this specific affirmation this week. There’s often certain truths that we don’t necessarily want to face. 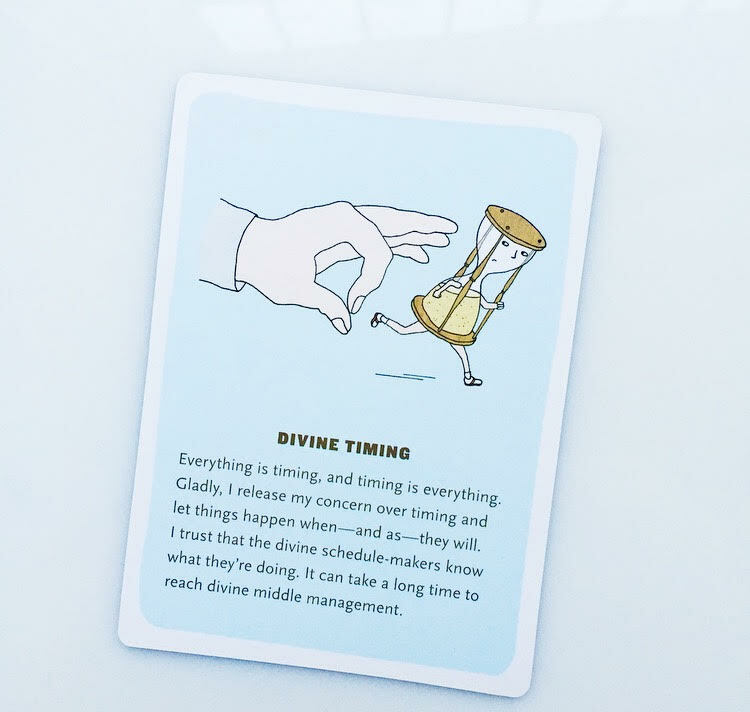 For me – it is the timing of certain life events. I’ve struggled with being on someone else’s time all my life. Working in the entertainment industry and dealing with creatives – my time didn’t belong to me anymore. I was in charge of expediting another humans divine timing or enhancing it. All the while stressing over certain life goals and milestones I wasn’t doing for myself… I started freaking myself out over the smallest things that didn’t happen for me within a certain “time” I was made to believe was “acceptable”. i.e : fulfilling career , promotion , healthy relationship , engagement , kids , blah blah blah. But you know what I realized? My divine timing was dictated by societies standards and not my own. The moment I learned to let go and be present is when things started falling in place. That’s not to say that I am where I want to be – rather accepting the fact that I am where I NEED to be. What’s #maktub (written) for you + I will be…in due time. So lets protect our sanity and appreciate that when our divine moment comes .. its pure magic. So lets protect it.